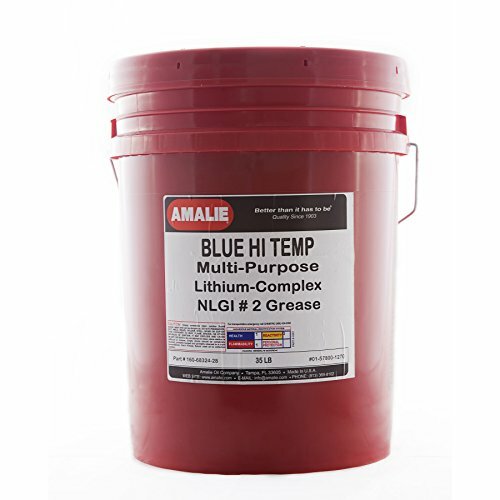 Amalie Blue Hi-Temp Grease is a premium, multipurpose automotive/truck chassis and bearing lithium complex lubricant meeting the NLGI GC/LB performance target. Applicable in a variety of automotive and industrial uses requiring extreme pressure protection, oxidation, inhibition, water resistance, and anti-rust properties, including; disc brakes, wheel bearings, chassis, ball-joints, 5th wheels and others. This popular grease is a lithium complex and is formulated with highly refined base oil and specialty additives to meet severe requirements of machinery. This grease is capable of operations from minus 40 degrees F to 350 degrees F, but with a dropping point of more than 500 F. Key features are: • Excellent mechanical stabily - resists thinning or hardening in bearings, minimizing leakage and maintaining extended service life. Very good oxidation and corrosion protection - via specialty additives minimizes chemical deterioration over extended periods of storage and service. Protects steel and copper alloy bearings against rust and corrosion. Outstanding Extreme Pressure Protection - provides effective wear protection for ball joints, drive shafts and other parts subjected to high pressure and shock loading. • Wide temperature Operation - offers excellent low temperature pumpability (-40 F) and high temperature (350 F) protection. Excellent Water Resistance - effectively resists washout and excessive dilution by water, assuring allweather lubrication. In general, recommended for extended service in heavy-duty automotive, truck, buses, farm tractors, construction equipment, high temp wheel bearings (disc brakes), roller and ball bearings, electric motor bearings, throw-out bearings, universal joints, chassis, fifth wheel and many others. This grease is suitable for medium size high speed bearings. It is robust multipurpose grease for a wide range of applications. If you have any questions about this product by Amalie, contact us by completing and submitting the form below. If you are looking for a specif part number, please include it with your message.